July temperatures averaged close to normal after a very hot start. With an average temperature of 76.6°F, July was almost cooler than June which averaged 75.9°F. High temperatures were 100°F or warmer the first four days of July, extending the consecutive day streak of 100°F+ days to nine continuing from late June. The nine consecutive days tied a record. The hot weather was due to a strong and persistent ridge of high pressure aloft over the western U.S. which finally broke down around July 5. A trough gradually replaced the ridge and temperatures dipped below normal July 12-18. An even cooler air mass came in with an upper level low pressure system July 26-27. The low temperature of 51°F on the 28th was the coolest July low since 2010. And the high of 75°F that day was 18°F cooler than normal. High pressure aloft quickly replaced the departing low and temperatures neared 100°F by month’s end. Thunderstorms containing monsoon moisture dropped 0.62 inch of rain on Boise July 8, resulting in areas of urban flooding. The rainfall was highly variable with some nearby locations reporting as much as two inches of rain. 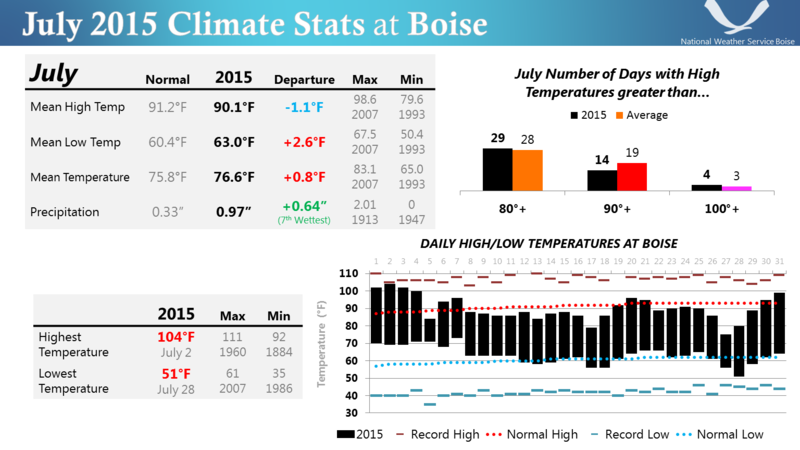 Boise had measurable rain seven consecutive days (July 8 through July 14), very unusual for a month that normally totals 0.33 inch. That much rain fell in only 5 minutes on July 8. The total rainfall this July was 0.97 inch, almost three times that of normal.